It is shown that the pyrocatechin (1, 2-dihydrohybezene) in an amount of 0.005 – 0.010 wt.% solid components has a pronounced plasticizing effect on mixtures of polyfraction corundum filler and colloidal SiO2-solution binder, stabilized with ammonia ions, intended for preparing cement-free refractory concrete. 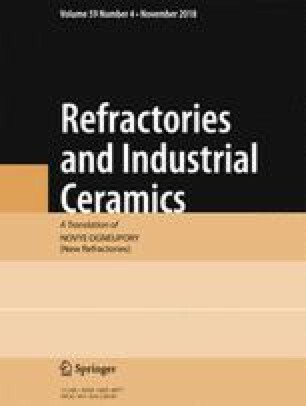 Self-consolidating refractory compositions are prepared with minimum water content. Translated from Novye Ogneupory, No. 10, pp. 49 – 52, October, 2018.